Hunter is proud to release the newest member to the water conserving Clik family of sensors for irrigation systems, the Soil-Clik. The Soil-Clik is a soil moisture sensing device that prevents water waste by limiting irrigation as the landscape reaches adequate moisture levels. 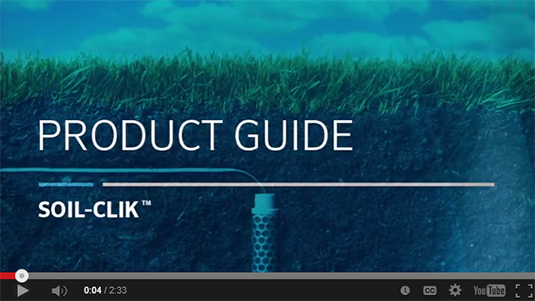 The Soil-Clik is compatible with all AC powered Hunter controllers and most major brands of irrigation controllers. The Soil-Clik has two components – a moisture sensor probe, which is placed in the soil up to 300 m from the host irrigation controller, and an electronic module, which communicates with the probe and the controller. The Soil-Clik probe uses proven technology to measure water available to the root zone, and the Soil-Clik module stops irrigation when it is no longer necessary. Both the control module and the probe are extremely simple to install and program, at a very affordable price point. Like all Clik family products, it has a 5 year manufacturer's warranty. For considerable water savings and prevention of over-watering, the Soil-Clik and the Hunter Solar Sync® are the ideal combination. The Solar Sync adjusts run times based on climate conditions, and the Soil-Clik prevents watering if the landscape is already wet. To learn more visit the Soil-Clik webpage or click on the video below.